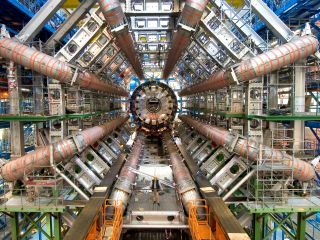 The scientists at CERN are shrugging off the fact that the future may be trying to stop their particle-finding mission and are ready to restart the Large Hadron Collider this weekend. Having been offline for over a year, the LHC has overcome its myriad problems and is ready to hunt for the elusive Higgs boson once more. Unlike a car in cold weather, the re-igniting of the LHC takes more work that simply pulling out the choke and revving the engine. Essentially the bods at the LHC have been spending months making sure that the 4km of beam tube belonging to the LHC is safe enough for five trillion electron volts to pass through it. Considering the Large Hadron Collider was knocked out of action because of some dodgy soldering, which meant a tonne of helium from the magnets seeped into the system (squeaky bum time indeed!) and short-circuited proceedings, work to ensure the LHC is safe has been nothing less than pain-staking. According to the BBC, hundreds of new detectors have been installed, which should stop this from happening again. If for some reason it does, then relay switches will mean the system will be out for days rather than a year. The switch-on time is a very precise 'early Saturday'. Fingers-crossed we will be notifying you of a successful launch first thing Monday! If not: "So long, farewell, auf Wiedersehen, adieu..."